An extended family originating from the Eastern Cape, lost their homes in 2nd Avenue, Alexandra Township today. The Hlombe family were just starting their day, cooking breakfast, when at 7a.m. their paraffin stove exploded. By the grace of God, no one was injured. But 24 people lost everything that they owned. It was a terrible day for Gift Hlombe, aged five, his mother Sarah Hlombe, his grandmother Mthetheleli Hlombe, uncle Musa Hlombe and all the other heads of household - Wiseman, Phineas, Cynthia, Zanele, Virginia and Simphiwe Hlombe. Living cheek by jowl, they hoped for rebuilding materials to refashion their shacks, but received none. 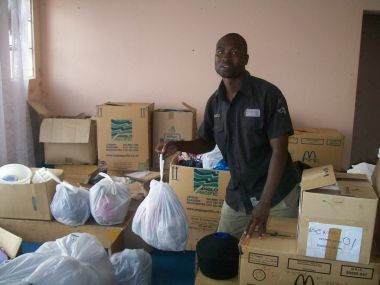 However Children of Fire's UMashesha volunteers within the township and from outside, came with food and clothes and other domestic necessities. For Reggie from Alex, he's seen more fire destitution than he can remember. For Abegail Ximba from Auckland Park, devastation has become commonplace. But for Doreen Msimanga, a 13 year old burns survivor from the deep rural Free State who lives with Children of Fire, this was her first time to really start helping other fire survivors. "Losing everything feels bad," the orphan said, "but having the chance to help, feels really good." UMashesha volunteer Ernie Hayter (23) at his first fire scene today, with some of the now-homeless babies in Alexandra township. Some 32 households are without shelter tonight in Alexandra township, Gauteng, South Africa. 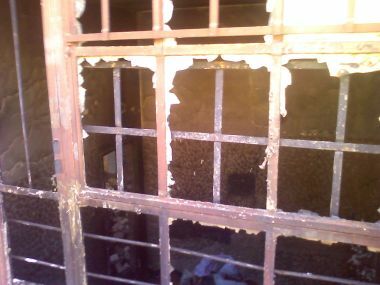 Khosi Nkabinde lies dead in a mortuary, burned beyond recognition at the hand of her boyfriend. He has fled the scene. Her murder-by-fire led to an inferno that devastated a community of shack dwellers on the edge of London Road and 1st Avenue. Among the many people left homeless by two different fires in the township, there are 13 little girls and 17 young boys. Three of the infants are aged only five or four months old. Children of Fire took the people a sack of macaroni, fresh vegetables, 10kg of rice and individual packets or soya mince along with the charity's unique disaster recovery bags with wash things (soap, toothpaste, toothbrushes, washing powder), crockery, candles, staple foods, lotion and clothes. 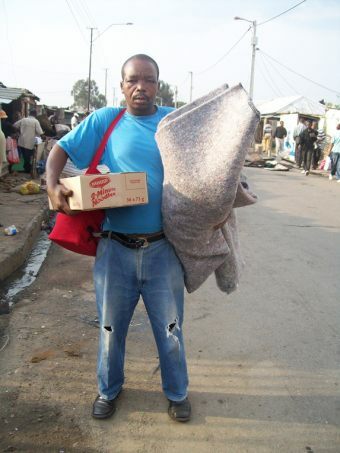 The charity also took all the blankets in its possession. 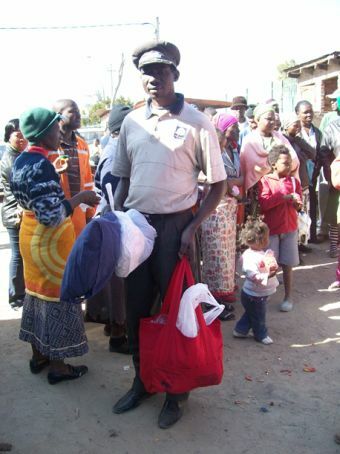 Residents said that someone from Home Affairs had given them pilchards and rice which they had eaten during the day. Fency of Disaster Management told them that he would source materials for rebuilding, but he did not return. Abegail Ximba, a Children of Fire UMashesha volunteer who made two visits (to the 1st Ave and 13th Ave fires) to hand-out donations today, said: "On this cold clear night, think of the infants sleeping under the stars." She asked: "Why doesn't Disaster Management at least have a plan to shelter the children in churches or school halls?" Mahatma Gandhi said: "The measure of a country's greatness should be based on how well it cares for its most vulnerable populations." Ximba added: "We are not so great when we let little children suffer in this way." Thank you to all our regular donors, new donors who have helped recently, Crawford Interact girls who handed on some clothes, Sasol, and Silver Star Travel. 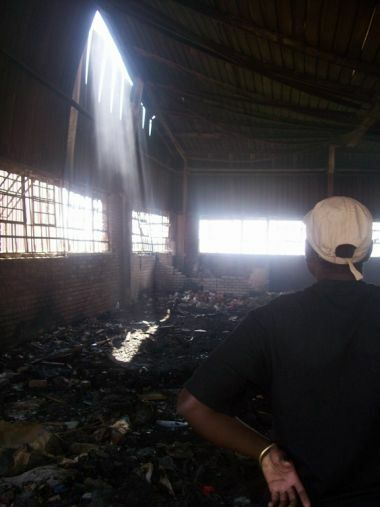 Mzwandile Zwane was born in the December 2009 sunshine, oblivious to the squalor of his family home: one of hundreds of shacks crammed into a disused factory in Marlboro, Gauteng. He heard the New Year merriment. He listened to the grownups complaining about the rain. And he heard the children's daytime voices decrease in January, as many of them went to school. But in early March 2010 the every-day pungent smell of paraffin stoves turned into a terrifying toxic scent of homes burning all around him. He and some 44 other children survived. But for what? What hope does their future hold? 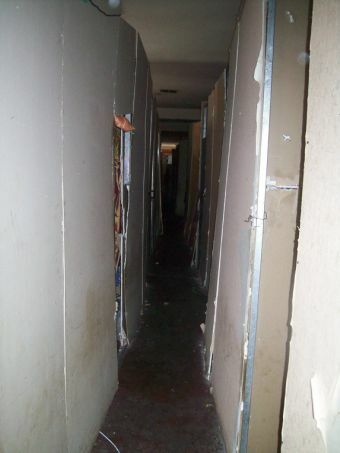 Squatter camps inside old factories and abandoned office buildings are not new. 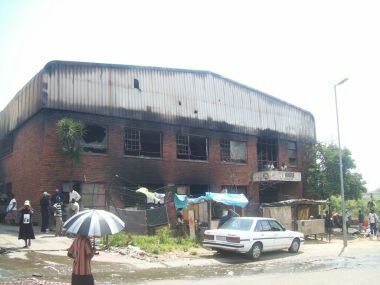 As the razor-wire wheel of crime and recession chased business away from Wynberg, Marlboro, Alexandra and even inner-city-Johannesburg offices were invaded by people desperate for somewhere to live, so the incidences of deadly fires grew. One wonders why there is even a Housing MEC at all, as every Department of Housing official in receipt of a salary in every local government region, has to know how many people are living in such patently-unsafe environments. The politicians may moan and wail as the flames fan across their television screens, but while they rush to pose among the ashes, are they even looking one block away, one street away, at the next over-crowded totally-insanitary absolutely-lethal illegal living situation faced by thousands of South Africa's citizens today? Why aren't our journalists simply picking up a map and taking a fat colour highlighter to show these hell holes that people like Mzwandile are born to die in? Because while the three-month-old infant has survived this time, what has happened to his lungs with the cyanide-laced mattresses burning down to bare springs? What happens to a boy living in such desperate circumstances where there is never enough to eat? What is the cumulative effect of poverty on him? And what is the effect on his soul? To live in overcrowded noisy hopelessness from the day he starts to walk, indeed from the day he starts to breathe. To listen to the neighbour's TB-laden wracking cough to the right? And to feel the punches of domestic violence through the shack wall to the left? Some 86 families lost their homes in Marlboro this week. But how many politicians offered even one of those children a bed for the night? It is time for Town Planning to plan this city we live in. To plan some humanity back into housing. The destitute children deserve more than destitute headlines. 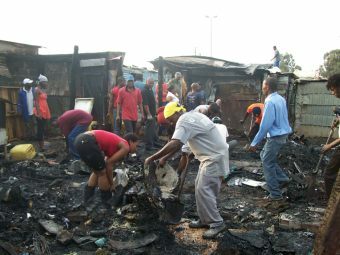 There was a fire in Seswetla, Alexandra late last night. The fire began in one man's shack, who subsequently died. Xola Bana was 30 years old. He leaves a widow and seven children. 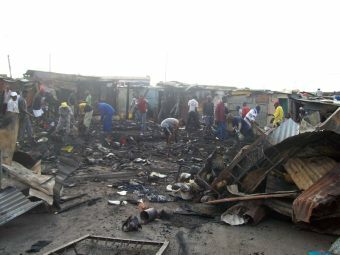 Some 12 other shacks burned down and at least 29 people were affected. Children of Fire's UMashesha volunteers Ellen Phillips, Rossina Malatjie, Sunny Sharma and Chris Wilson handed out clothes, shoes, tea and cupcakes (the cupcakes were donated to us last night following surplus from a fashion launch at Bamboo in Melville... we also shared them with children in Slovo squatter camp at our Sunday-morning reading scheme). 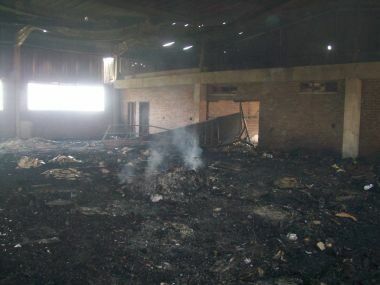 The Seswetla fire was attributed to a fallen candle. Also affected were Betadi Frederivo and his wife; Friday Phoshoko; Alpheus Ralepelle; Michael Ngwaila, his wife and their son aged six years; Godfrey Ndlovu and his wife; Calvin Monyai and Gilbert Chauke. Thanks to our usual donors for allowing us to respond within one hour of the request from residents for help. Another fire has left families homeless in Alexandra Township, Johannesburg. 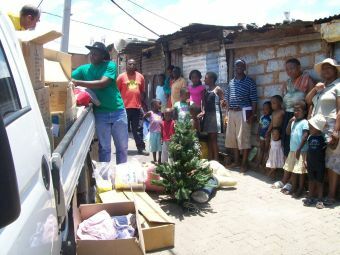 On Friday 3rd July 2009 Children of Fire was called out and helped 120 <<...>> people left destitute by shack fires on 13th Avenue, and again on Sunday 5th July 2009 another 16 people had to rebuild their homes after a fire broke out in Setswetla. 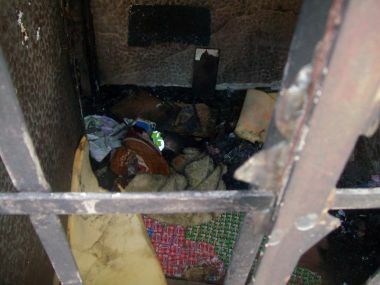 The fire started in the early hours, approximately half-past midnight on Sunday morning when young mother Gina Mthembu was using a paraffin stove to boil water. With a blanket wrapped around her and her child to keep warm, she turned in the cramped shack and accidentally set the blanket alight. The fire spread quickly, taking out another four homes. 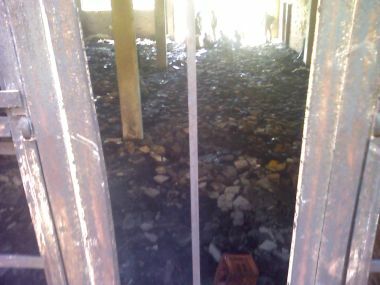 A sixth shack sustained smoke damage. According to residents it took the Alexandra and Sandton fire brigades two hours to respond once the alarm had been raised. 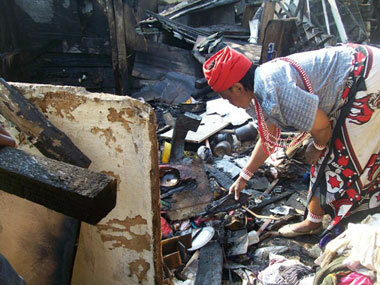 By the time they arrived residents had extinguished the fire themselves using buckets of water. The mother's child Elias Msonda (9 month old boy) sustained second degree burns on his forehead. 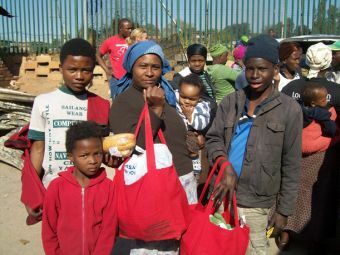 Children of Fire brought food and clothes donated from Pick n Pay customers in the Gallo Manor, Rivonia, Morningside, Morning Glen and Benmore Stores where trolleys had been left at the front of the stores. 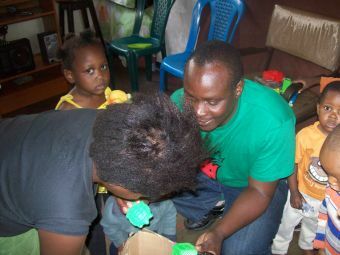 The charity also donated blankets, additional clothing and toys to children. 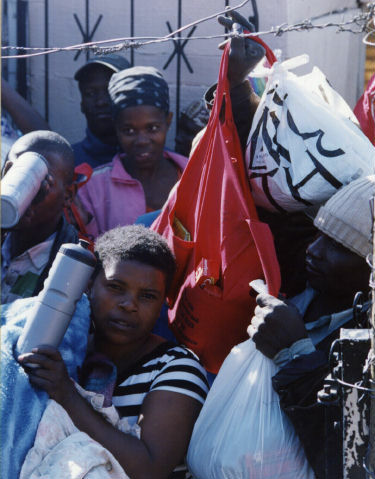 Each family was left with a food hamper containing items such as maize meal, tinned pilchards and porridge oats to keep stomachs full while they rebuilt their homes. 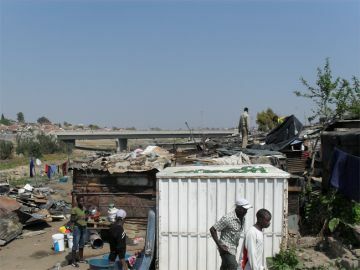 Disaster Management brought some old and new materials for shacks to be rebuilt, but no provision was made by the Department of Housing to give them temporary shelter. 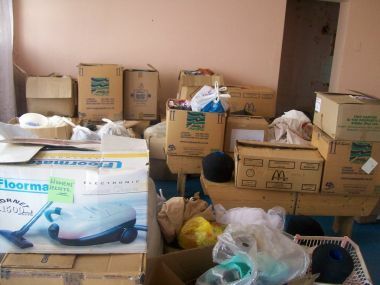 On Sunday the charity revisited residents of 13th Ave and donated more food and clothes. The shacks were almost finished, and the people were more cheery than two days ago. At least four people had slept outside on Friday and Saturday, as they had nowhere else to stay until their homes were rebuilt. 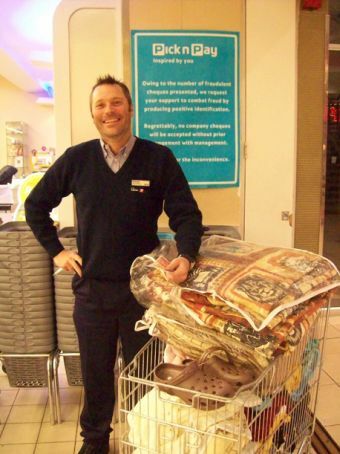 Thanks to Pick n Pay staff, customers and particularly to UMashesha Chris Wilson and Rossina Mokgano. Another fire has left families homeless in Alexandra Township, Johannesburg. 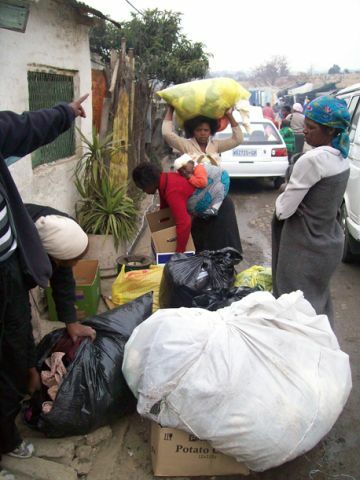 On Friday 3rd July 2009 Children of Fire was called out and helped in excess of 100 people left destitute by shack fires on 13th Avenue, and again on Sunday 5th July 2009 another 16 people had to rebuild their homes after a fire broke out in Setswetla. 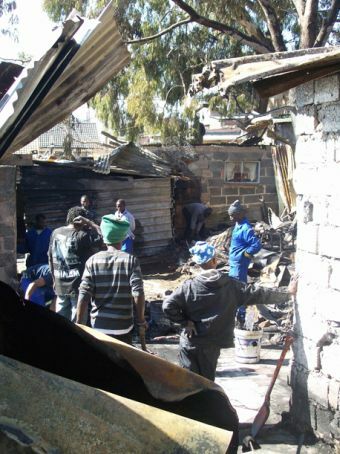 The fire started in the early hours, approximately half-past midnight on Sunday morning when young mother Gina Mthembu was using a paraffin stove to boil water. With a blanket wrapped around her and her child to keep warm, she turned in the cramped shack and accidentally set the blanket alight. The fire spread quickly, taking out another four homes. A sixth shack sustained smoke damage. 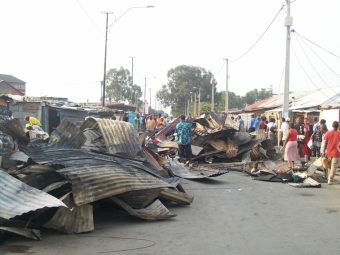 Disaster Management brought some old and new materials for shacks to be rebuilt, but no provision was made by the Department of Housing to give them temporary shelter. 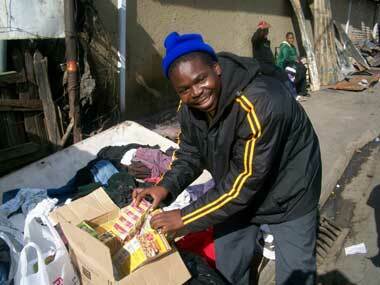 On Sunday the charity revisited residents of 13th Ave and donated more food and clothes. The shacks were almost finished, and the people were more cheery than two days ago. At least four people had slept outside on Friday and Saturday, as they had nowhere else to stay until their homes were rebuilt. Thanks to Pick n Pay customers and particularly to UMashesha Chris Wilson and Rossina Mokgano. Residents survey the scene, crumpled corrugated iron piled behind them, as they prepare to rebuild lives devastated by fire. Again. 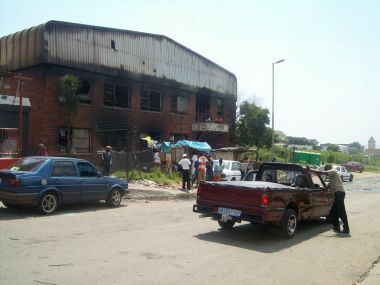 13th Avenue, Alexandra Township, 3rd July 2009. Residents survey the scene, crumpled corrugated iron piled behind them, as they prepare to rebuild lives devastated by fire. Again. 13th Avenue, Alexandra Township, 3rd July 2009. Pictures may be reprinted if the source is acknowledged. 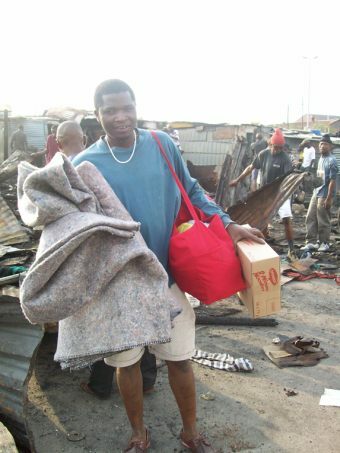 On July 3rd 2009, Children of Fire helped more than 100 people with food, clothes, pillows, blankets, soap powder, toys and more after a massive fire in Alexandra. 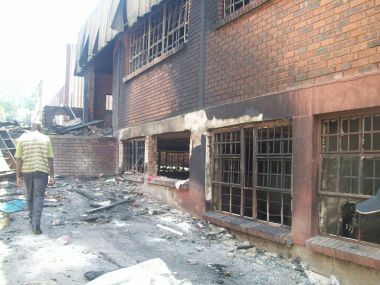 The fire was exacerbated by the slow response of fire fighters, due to a strike. 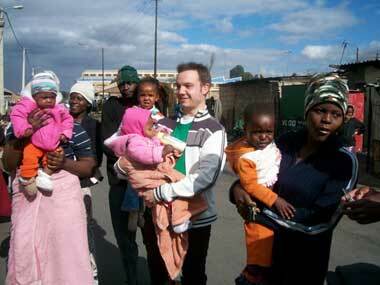 Many children were among those who lost their homes, including a two-week-old baby girl. 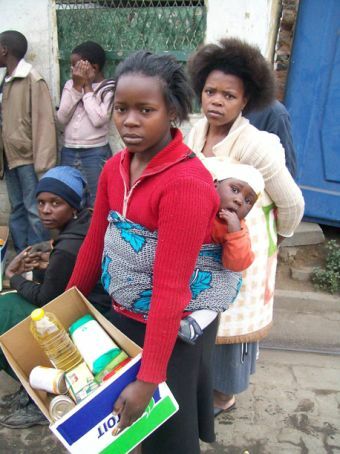 One mother who is due to give birth in a week or two, lost all her baby clothes that she had already bought. 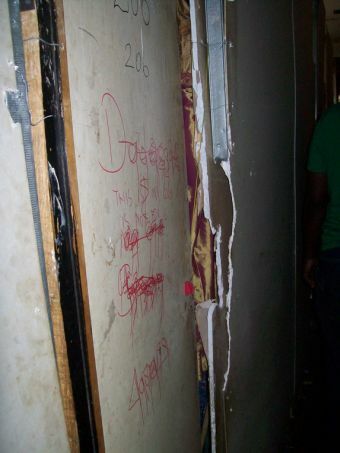 The Heads of Household of the shacks affected are numbered below. We understand that there are still several families to be added to the list. Two of our UMashesha volunteers remain on the scene. 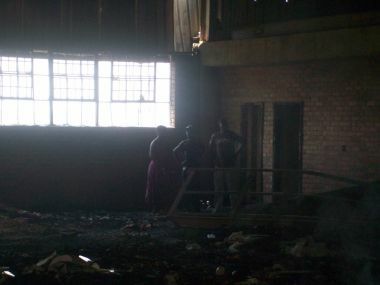 There were 22 girls and 13 boys among the children left homeless by a fire and a fire fighters strike in Alexandra Township, Greater Johannesburg. The youngest, Thandaza Mgondo, was born just two weeks ago in mid June 2009. A cruel start to life that will remain cruel. Scores of homes were razed as there were no fire fighters in Alexandra when the fire began and residents claimed that Sandton Fire Brigade took one hour to travel the three kilometres to the scene. 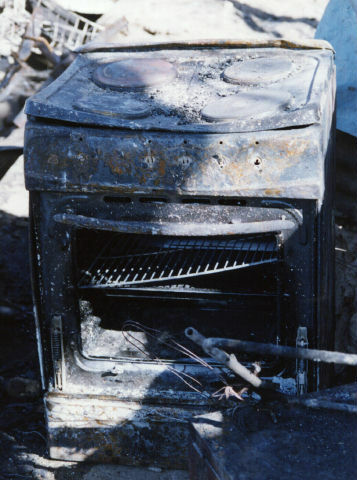 The fire was allegedly due to an electric two plate stove left on after a power cut. 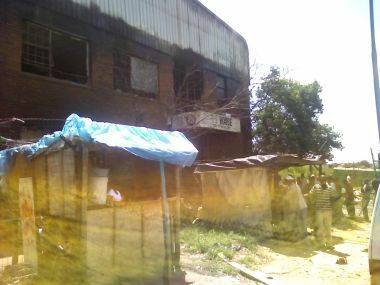 The power came back on and items left on the stove caused a major blaze in shacks near the corner of 13th Avenue and London Road. At least 103 people were left destitute, but the figure is expected to climb when people who travelled to rural areas for the school holidays return to find themselves homeless. Several Pick n Pay stores immediately rose to the challenge when Children of Fire asked them for help, with lots of soup, bread and fruit. 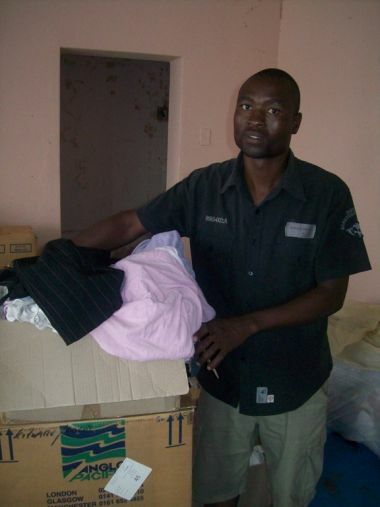 One heavily-pregnant woman lost all the baby clothes she had bought for the child whose birth is due any day now. Children from an adjacent cr�che watched, faces pressed against a chain link fence in astonishment, as people dragged away the crumpled metal sheets and the debris of their lives, flattening surfaces to start life all over again. 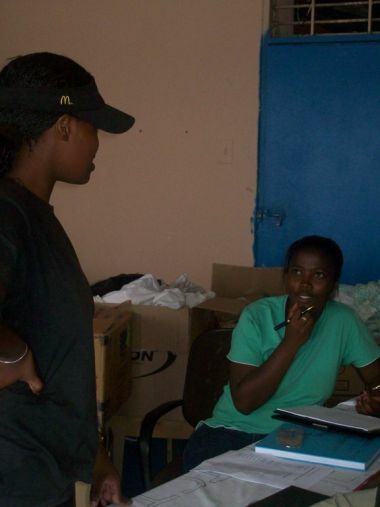 Margaret Hansen (19) a University of Cape Town student and a new UMashesha (fast mover) volunteer, said: "The people were extremely busy, demarkating the places where their shacks stood and rebuilding them. "Boys with wheelbarrows of ash were leaving the area all the time. The air smelled of burnt plastic." Our thanks to UMashesha volunteers Abegail Ximba, Margaret Hansen, Lindiwe Ngwenya, Michael Wessels, Wytske van der Werf, Christopher Wilson, Obed Madu and to all the long-term donors who allowed us to respond speedily. Disaster Management is providing most households with six sheets of corrugated iron "zincs" and four wooden poles, for rebuilding. 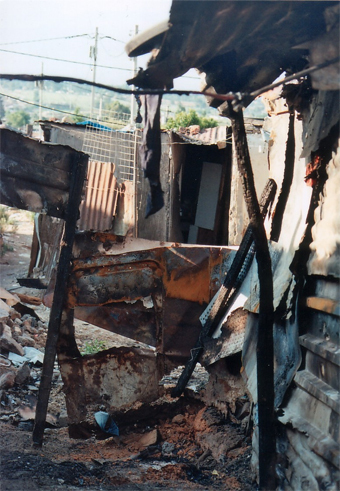 Lerato's home burned down on the first November 2008 weekend, in Alexandra Township. Crumpled metal and ash are all that remain. Children of Fire responded to a request for help, taking disaster recovery bags, blankets, clothes, food and toys through to the families affected off 18th Avenue. 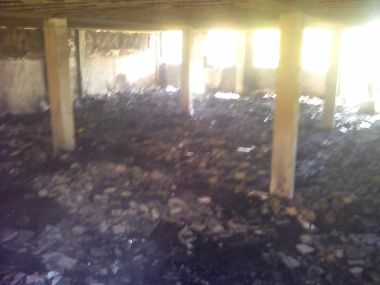 The families said that they did not know the cause of the fire. The Fire Brigade attended the fire but by late Sunday they had received no material assistance except from Children of Fire. 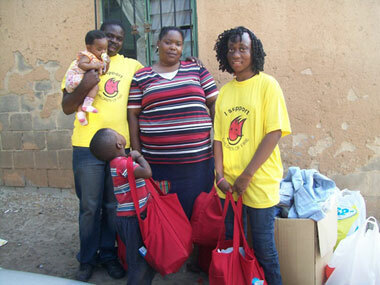 UMashesha volunteers Muziwakhe Zim (22), Lindiwe Ngwenya (23), Velly Dludlu (24) and Children of Fire director Bronwen Jones distributed the goods. They advised residents how to seek re-building materials from Disaster Management and to notify Environmental Health about the raw sewage in the adjacent street. 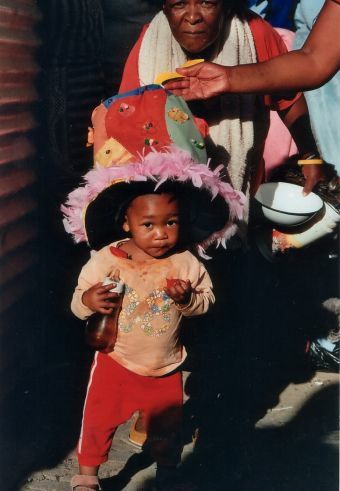 Amidst the misery, Lerato enjoyed the taste of succulent strawberries, thanks to Woolworths and an Easter bonnet from the eclectic selection of toys donated to the charity. The one year old girl stashed an extra strawberry in her T-shirt for later� For a moment she was happy. Thanks to our regular donors who make it possible for us to react quickly. April 2009 pictures of safety hazards in Johannesburg's indoor squatter camps. 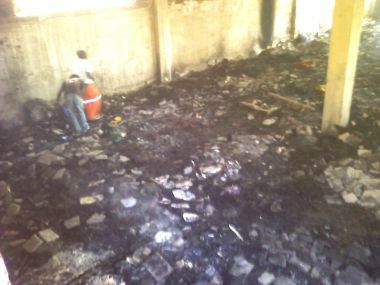 Three pictures attached, show the alleyway between shacks inside an indoor squatter camp (imagine trying to escape when this is on fire? 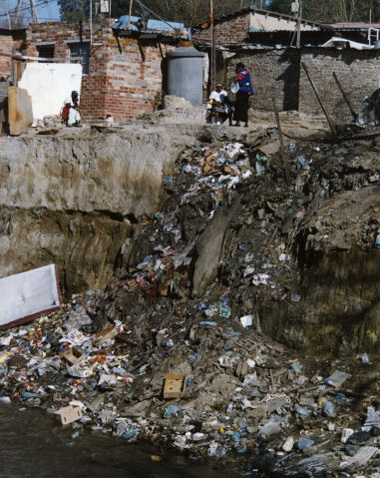 ); pools of human urine and excreta where families live; the exterior of one of the dangerous buildings. 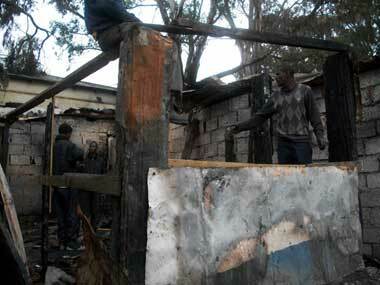 When this indoor shack (see attached picture) burns, how will the emergency services save the people inside? 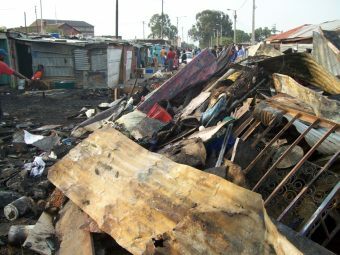 What is the housing MEC doing about these living conditions? 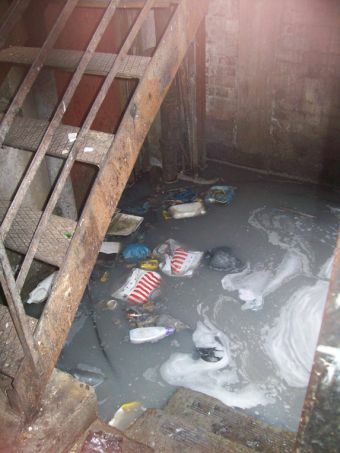 When children fall into this lift shaft (picture attached), who will even hear their screams? 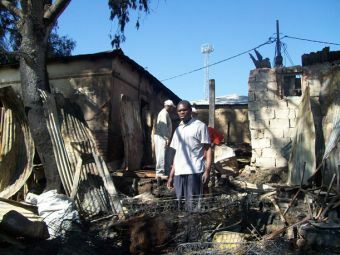 People helped by Children of Fire on 26th November 2008, just after losing their homes to fire near Rooth Street, Alexandra Township. Children of Fire is very concerned about the number of indoor squatter camps that exist in greater Johannesburg and in other areas. 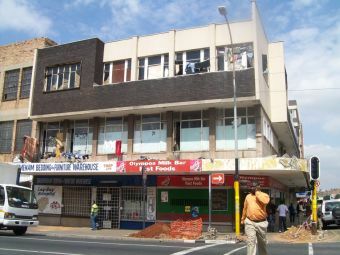 When people invade derelict buildings that were once office blocks or factories, they are not built to accommodate high-density informal housing. All the normal environmental health and other requirements seem to be ignored. City officials have to know that the people are living in these dangerous places, but they do not enforce their own regulations. 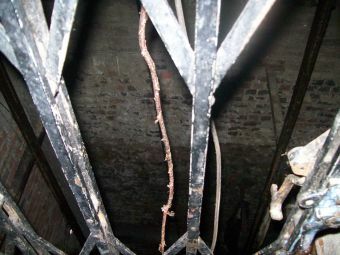 There are open lift shafts where young children and others could fall into them. 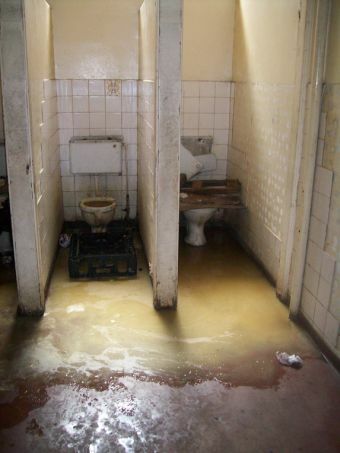 There is no functioning sanitation. There are pools of human excrement. There is exposed electrical wiring. There is enormous danger from fire. It has been alleged to the charity, that building owners or city officials use the law to evict communities and that then lawyers, maybe acting with good intentions, then wait for certain judges to be on duty, and then get communities reinstated in the buildings that they have been evicted from. 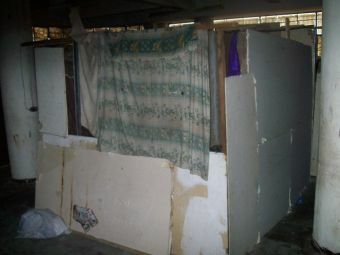 A squatter camp inside a building is a death sentence. South Africa supposedly no longer has the death sentence. But the law is being misused to place people inside these lethal buildings, with no realistic attempt to source them alternative accommodation. 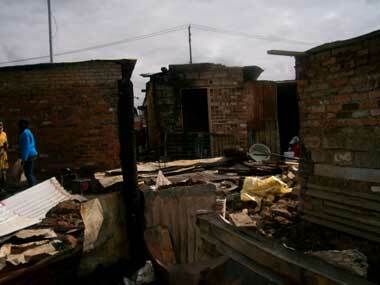 If a fire breaks out at night in one of these indoor squatter camps, people will die. By acting now, those deaths could be prevented. Our volunteers have been on site to share toys with children living in these perilous circumstances and to view the living conditions first hand. 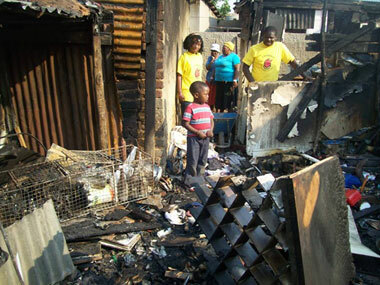 Children of Fire was on the scene one and a half hours after a call for help, with blankets, food, clothes, toys and household items for families left destitute after fire in a squatter settlement near Rooth and 1st, in Alexandra Township, Gauteng, on 26th November 2008. 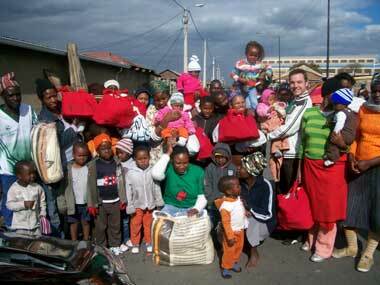 UMashesha volunteers from Auckland Park and from Alex were on the scene at Rooth Street, Alexandra Township, with blankets, food, clothes, toys, wash things, etc., for all the families, within one-and-a-half hours of getting a call from Disaster Management requesting our help on the afternoon of 26th November 2008. The cause was an exploding paraffin stove (the old-style illegal ones). 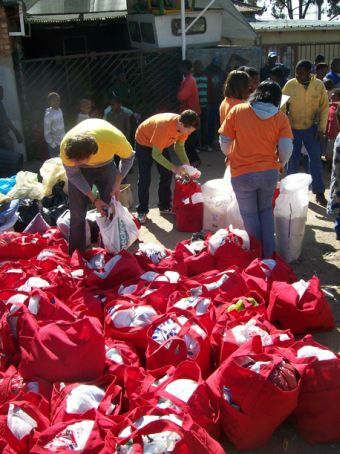 Some of the recipients of disaster recovery bags in Alexandra on November 2, 2008. People assisted included Thoko Ngubane, Rosina Ramahlo, Zinhle Ngubane, Sabu Khumalo, Mathapelo Ramahlo, Kamogelo Ramahlo, Thabang Ramahlo, Balikan Ramahlo, Lerato Ramahlo, Tototo Khumalo, Nkosi Sibanda Themba, Nozuko Ndongeni, Bonga Ndongeni, Ntokozo Ndongeni, Lwazi Ndongeni, Tebogo Ndongeni, Nokwazi Ndongeni, Nomasonto Zwane. 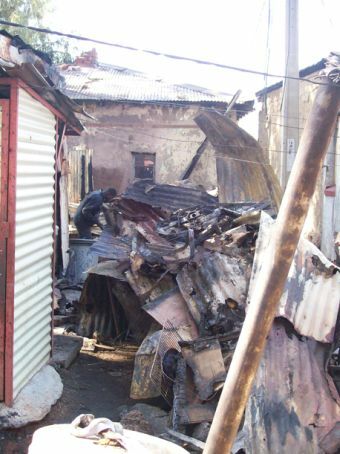 Remains of shack after fire off 18th Avenue, Alexandra, November 2008. 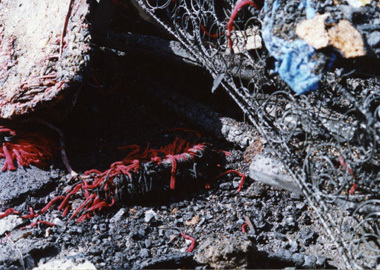 The debris left after a fire in Seswetla, Alexandra Township in August 2007 shows that the residents who had just lost their homes, were Shangaan as the red and black remnants of a traditional Shangaan skirt lies among the debris. 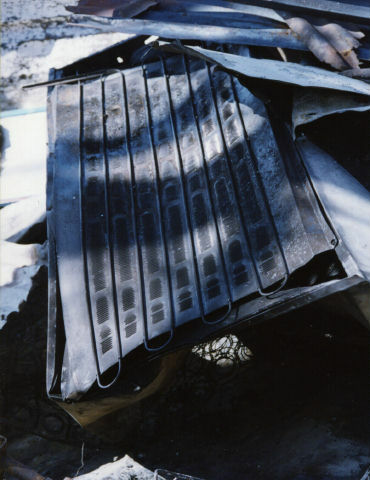 Only the metal coils of a mattress remain, the highly toxic foam having burned to nothing. 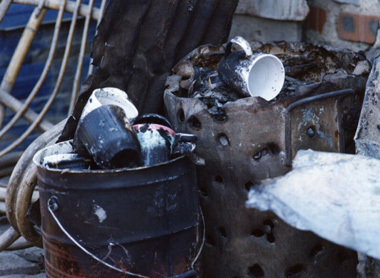 Collected in an imbawula (brazier) are a pile of sooty mugs. The ceramic survived the Seswetla, Alex, blaze and so the mugs will be washed and used again. Barely anything else useful survived the flames. 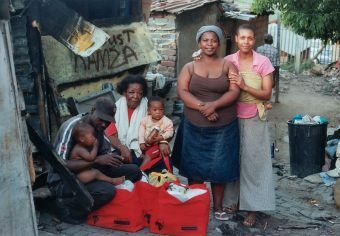 Happy recipients of Children of Fire�s disaster recovery bags at the second Seswetla fire in the space of two weeks in August 2007. 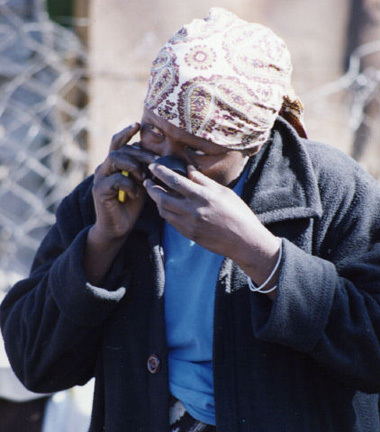 Snuff sniffing adds to the respiratory ill health of township residents who survive fire after fire, use of paraffin, wood and coal for cooking and other environmental pollution. Seswetla, August 2007. A prized new refrigerator lost in a Seswetla, Alex fire. 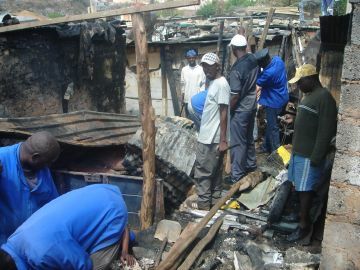 Electricity (legal or illegal) does not save residents from fires � indeed it is a liability in crowded shacks, especially with frequent power cuts. When the electricity is off, people forget to turn off their stoves or other appliances and this leads to fires. Second Alexandra fire Seswetla, August 2007 � a burned out stove from a shack. 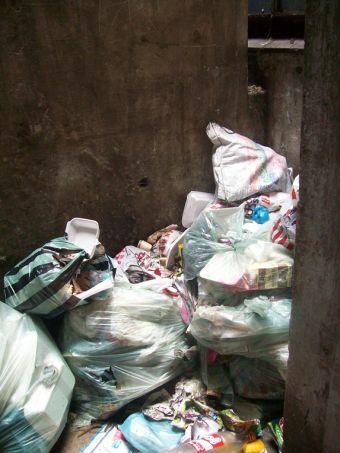 If Alexandra township environmental health officials don�t deal with this issue, it is an uphill struggle for non governmental organisations to make the area safer from fire and other health hazards. August 2007 next to the Juskei.